defined a generation. In an astonishingly honest, comic, and moving account of his tour of duty in Vietnam, master storyteller Tracy Kidder writes for the first time about himself. This extraordinary memoir is destined to become a classic.Kidder was an ROTC intelligence officer, just months out of college and expecting a stateside assignment, when his orders arrived for Vietnam. There, lovesick, anxious, and melancholic, he tried to assume command of his detachment, a ragtag band of eight more-or-less ungovernable men charged with reporting on enemy radio locations. He eventually learned not only to lead them but to laugh and drink with them as they shared the boredom, pointlessness, and fear of war. Together, they sought a ghostly enemy, homing in on radio transmissions and funneling intelligence gathered by others. Kidder realized that he would spend his time in Vietnam listening in on battle but never actually experiencing it. With remarkable clarity and with great detachment, Kidder looks back at himself from across three and a half decades, confessing how, as a young lieutenant, he sought to borrow from the tragedy around him and to imagine himself a romantic hero. 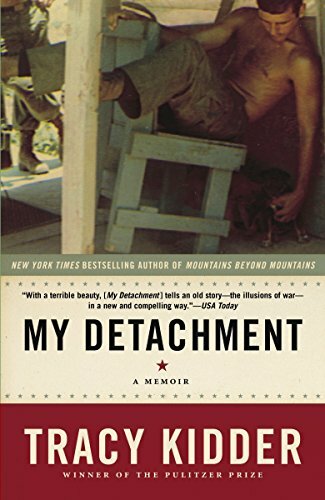 Unrelentingly honest, rueful, and revealing, My Detachment gives us war without heroism, while preserving those rare moments of redeeming grace in the midst of lunacy and danger. The officers and men of My Detachment are not the sort of people who appear in war movies–they are the ones who appear only in war, and they are unforgettable.From the Hardcover edition.